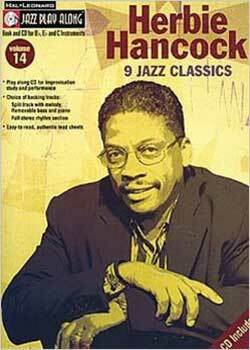 Jazz Play-Along Volume 14 Herbie Hancock PDF + Mp3 CD download. Perhaps the greatest Jazz Pianist ever, Herbie Hancock has been an innovator of Jazz since the 1960s. He achieved world renown as part of the Miles Davis Quintet and with his dozens of solo and ensemble albums he has released across four decades. This set contains a versatile Play-along CD for improvisation, study and performance, and with a choice of backing tracks (A split track with melody, removable bass and piano parts and a full stereo rhythm section), and easy to read, authentic and accurate lead sheets, players of all instruments will enjoy these terrific pieces. This fabulous Jazz Play Along package contains nine Jazz classics by this great performer, all suitable for B Flat, E Flat and C instruments. Includes Tell Me A Bedtime Story, Watermelon Man and One Finger Snap. Download Jazz Play-Along Volume 14 – Herbie Hancock PDF free and other books from our site. Only high quality PDF scans. Please write a review, it's important for our community.